from the album Pisces, Aquarius, Capricorn & Jones Ltd.
"Pleasant Valley Sunday" is a song by Gerry Goffin and Carole King, most famous for the version recorded by The Monkees in 1967. Goffin's and King's inspiration for the name was a street named Pleasant Valley Way, in West Orange, New Jersey where they were living at the time. The road follows a valley through several communities among the Watchung Mountains. The lyrics were a social commentary on status symbols, creature comforts, life in suburbia and "keeping up with the Joneses". It became one of the Monkees' most successful singles. Chip Douglas, producer of the Monkees' music during 1967, also played bass guitar on some of their recordings. (This freed up Peter Tork to play keyboards.) He showed lead guitarist Michael Nesmith the lead riff used throughout the song. Nesmith doubletracked the lead guitar riff, while Peter Tork and Davy Jones added piano and maraca parts. "Fast" Eddie Hoh, a session musician, played drums. Micky Dolenz sang lead vocals, and was the only member of The Monkees who did not play an instrument on the track. For an ending, Douglas and engineer Hank Cicalo decided to "keep pushing everything up", adding more and more reverberation and echo until the sound of the music became unrecognizable, before fading out the recording. Separate mono and stereo versions were mixed for single and album records. The single peaked at #3 on the Hot 100 and was featured in the second season of their television series. The song also appeared on the fourth Monkees album, Pisces, Aquarius, Capricorn & Jones Ltd., in November 1967. While mono copies of the album had the same version heard on the single, stereo copies had a version using a different take of the first verse and an additional backing vocal during the break. 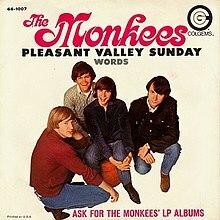 In February 1986, MTV featured a marathon of episodes of the series titled Pleasant Valley Sunday, which sparked a second wave of Monkeemania. The reunited Dolenz, Tork, and Davy Jones, already on tour, went from playing small venues to playing arenas and stadiums in the following weeks. The B-side song, "Words", was written by Boyce and Hart. 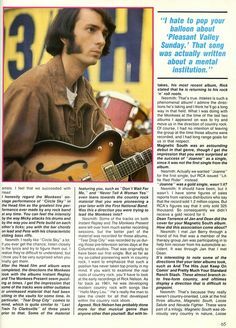 In a 1978 interview with Blitz Magazine, Mike Nesmith jokingly corrected the interviewer who regarded the song as being about suburban America: "I hate to pop your balloon about 'Pleasant Valley Sunday'. That song was actually written about a mental institution." In the season 5 episode "To Live and Let Diorama" of Gilmore Girls, the song is heard playing at the music store owned by Sophie Bloom (a character played by Carole King, who co-wrote the song). The Wedding Present covered the song on their 1992 RCA release Hit Parade 1. In the episode "McStroke" from Family Guy, this song plays in the background during a classic hallway chase scene. The pop punk band The Mr. T Experience covered it on their record Everybody's Entitled to Their Own Opinion. The Christian band Code of Ethics covered it on their 1995 album Arms Around The World. Neal Morse, lead singer of Transatlantic, and former lead singer of Spock's Beard, covered the song on his 2006 album Cover to Cover. The track "Pleasant Valley Monday" from the album Puroland by noise artist Merzbow was inspired by this song. In 2002, Mark Mothersbaugh covered the song for the TV show Hidden Hills. ^ "The Monkees - Pleasant Valley Sunday / Words". Discogs. ^ "Pleasant Valley Sunday - The Monkees - Song Info - AllMusic". AllMusic. ^ La Gorce, Tammy. "New Jersey's Magic Moments", The New York Times, October 30, 2005. Accessed November 25, 2007. ^ "Photographic image of Blitz article" (JPG). S-media-cache-ak0.pinimg.com. Retrieved October 1, 2016. ^ "flavour of new zealand - search listener". Flavourofnz.co.nz. Retrieved October 1, 2016. ^ "Billboard.com - Hot 100 - Week of August 19, 1967". Billboard.com. Retrieved May 15, 2011. ^ "Official Charts - Top 40 Official UK Singles Archive - 26th August 1967". theofficialcharts.com. Retrieved May 15, 2011. ^ "Top 100 Hits of 1967/Top 100 Songs of 1967". Musicoutfitters.com. Retrieved October 1, 2016. Lefcowitz, Eric (1985). The Monkees Tale. Berkeley, CA: Last Gasp Press. ISBN 0-86719-338-7. Baker, Glenn A.; Czarnota, Tom; Hogan, Peter (1986). Monkeemania: The True Story of the Monkees. New York: St. Martin's Press. ISBN 0-312-00003-0.